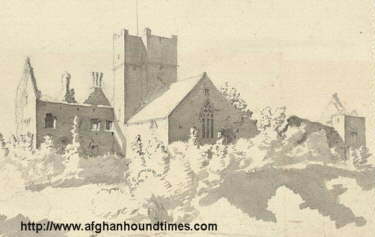 For a long time I have wanted to document the founding kennels in the USA of Prides Hill and Kandahar. I delayed embarking on this project because I knew this would involve extensive research and time in order to fully document the history and contribution to the breed that these two kennels made. I am pleased, to finally start this project on Kandahar, and hopefully provide an interesting history of these two remarkable women and their important kennel - Kandahar. The caption with the photo above of Amelia White (often called "Elizabeth" instead of "Amelia" and vice versa by her friends) states the photo was taken in 1972 a few days before her death at the age of 94. I am not sure that is correct because the caption states that she is with "another of her beloved Afghan Hounds". 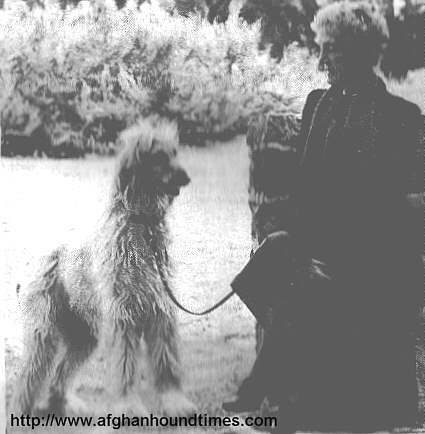 Amelia White ceased breeding in the 1940's and the Afghan pictured seems to be of that era, rather than of the 70's. I have seen a seperate photo of the Afghan Hound pictured in a publication and attributing a name to the Afghan Hound, which is from the 40's, but the other publication doesn't give any reference or validation of their information. Thus, I conclude this is more likely an older photograph taken in the 40's, rather than a later photo taken in 1972, but I don't know for a fact either way. 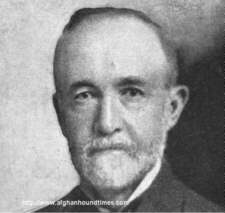 Steve T.
Amelia White's father made his money as Owner/Editor of the New York Times and The Chicago Tribune, originally 'gaining fame' for reporting the famous seven senatorial election debates of Abraham Lincoln and Stephen Douglas. His daughters Martha and Amelia (we know her as Amelia White but others knew her by her second name - Elizabeth) set up 'El Delirio' in Santa Fe, New Mexico in the 1920s. It was here Amelia bred and owned her Kandahar afghan hounds and Rathmullan Irish Wolfhounds and employed Scotman Alex Scott as their kennel manager (who handled the dogs in the show ring), The two sisters became famed patrons of the Arts - especially promoting native Indian art to NY society and having writers/painters etc stay to work on many famed pieces. The property still exists today - at 660 Garcia St Santa Fe - and a trust the sisters set up - now called SAR (School for Advanced Research) still promotes the same philanthropical approach to artists and writers today and fosters native American Indian art from the very same premises that was once the sisters' home. The once kennel block is today the library at SAR and contains many pictures and also movies of the Afghan hounds and Irish wolfhounds there taken as far back as the 1920s. Both Steve Tillotson and myself are or have been honorary members of SAR. Incidentally, the marked graves of their dogs are kept as they were when the sisters lived there. They are both buried there also. Neither married, but today there are descendants of their only sibling (another sister). The house is on part of the famous Santa Fe Trail and in downtown Santa Fe 'the Amelia White Park' is a lasting memorial to the work and life of 'our Amelia'. I agree with Steve Tillotson that this pic is likely to have been taken more around the time you suggest. The dog is reminiscent of Amanullah of Kandahar - and this dog could easily be as much as 12 to 14/15 years old here - that would place this pic in the mid 1940s and Miss White in her later 60s and the dress and her appearance also seem well in line with that period. I love the way she is looking at the dog. I believe she truly loved the breed and each of her dogs. Horace White, father of Amelia Elizabeth White and Martha White was editor in chief and one of the owners of the Chicago Tribune from 1864 to 1874. He was also in later life editor of The New York Evening Post from 1899 to 1903 when he finally retired. Horace White died in 1916 shortly after he was struck by an automobile in New York city. Prior to the sisters eventual move to Santa Fe, New Mexico, the sisters are recorded in 1917 as residing at West 69th St New York. Horace's first wife died in 1859, and he married his second wife in 1875. This marriage produced Horace's third daughter - Abby Macdougal, but we have no further information on her. A bit of family trivia - Martha was named after her mother, Martha Hale Root of Chicago (Root is Martha's middle name) the first wife of Horace. Amelia was named after Ameilia J MacDougall Joliet, from Illinois, Horace's second wife. Amelia Elizabeth White preferred to be called "Elizabeth", but Amelia seems to be the most oft used name for her. Amelia and Martha were raised by an Irish nanny after their mothers death. They named their kennel "Rathmullan" after a castle they once visited in Ireland. According to The American Journal Of Nursing, December 1918, Amelia served as a nursing assistant in the great war and was stationed at the US Army Base Hospital Camp Shelby which was located in Forrest County, Miss., 10 miles from Hattiesburg.. By all accounts the facilities at Camp Shelby were extremely basic. The White family owned valuable property in the old Armenta Spanish Land grant iin Santa Fe, New Mexico. Via their ownership interest in the Chicago Tribune,( they were significant shareholders) the family had accumulated additional wealth. Amelia was described as "bold and eccentric". Martha died in 1937. Amelia died at age 94 in 1972.